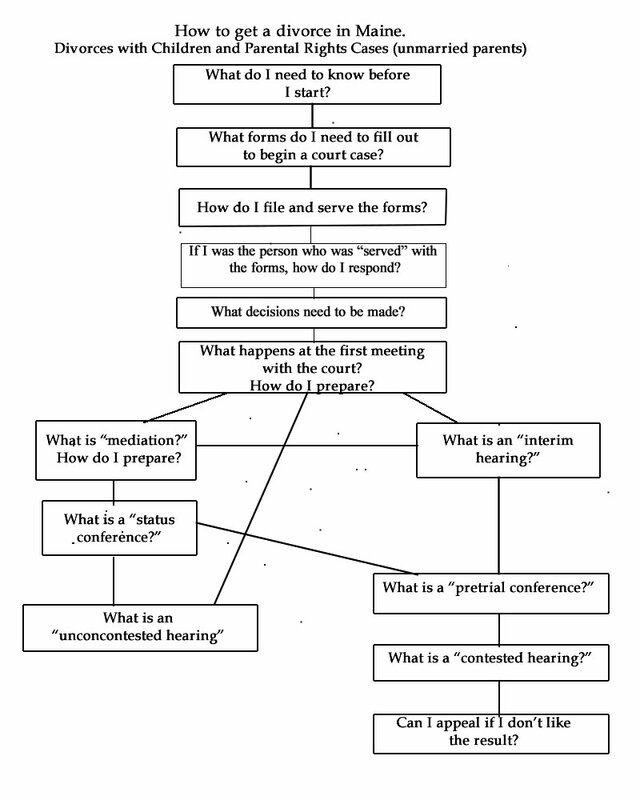 This classroom is here to help you through the Maine Court's family law process. We hope that this will help you feel more confident about dealing with the legal system. Is this classroom for you? You want to separate or establish "Parental Rights and Responsibilities"
If you are married, but you don't have children together, this is not the guide for you. Go here for information about getting a divorce without children. We've set up this classroom to reflect the most common path divorce and parental rights and responsibilities cases take. The numbered steps are in the order you will need to complete them. Some more complicated cases will have other steps, such as an interim hearing or a pre-trial conference. If one of these come up in your court case, visit these steps in the classroom for more information. Since these steps are less common, they are listed below the numbered steps. You can visit this information whenever you need it. Is your court case already underway? If you're coming to this classroom mid-way through your court case and aren't sure where to start, look at our Divorce and Parental Rights and Responsibilities Roadmap. It lays out the entire process, and will help you figure out where to start. You can also use this Roadmap to get a big-picture view of the entire process. We've created this classroom so you can walk through a legal process step-by-step and keep track of your progress. The most common steps are in order and numbered. We've also included information about other, less common, things that might come up during your case. These steps are at the end of the list, and you can visit them any time, if you need them. To navigate between sections of the classroom, you can either click on the name of the step you want to visit, or use the "next" and "previous" buttons at the bottom of each page. When you're done with a step, you can click on the gray checkmark next to it, which will turn the checkmark green. Next time you come back to the classroom, you can pick up where you left off. If you just want to learn more about the process, you can read through the steps in the classroom without checking them off. If you check something off by mistake, just click on the checkmark again to un-check it. You may want to start by watching our video. It gives a quick overview of the process. Then move on to the more detailed information below. We also offer an important guide to effective parenting during a separation - to help your kids cope and to avoid putting them in the middle. This "Families Change" Guide also includes sections for teens and younger children, to help them deal with their difficult feelings during their parents' separation.